Michael Urban’s book on blues music in Russia was translated into Russian and appeared as a special edition of the journal Logos. 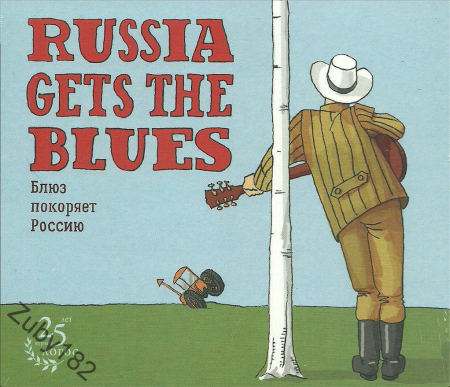 The editors also brought a number of Moscow-based blues musicians into the studio and recorded an anthology of blues songs for a CD (pictured) that accompanies that issue of the journal. Methyl bromide has been used by growers since the 1970s to control soil pathogens, weeds and nematodes. Pictured are pathogen-infected plants in a buffer zone where fumigants can't be applied. Read more. “What does a nation taste like?” asks Melissa Caldwell in an article in Discover Society that explores how culinary experiences are connected to citizenship and corporeal identity. “What is it about food that makes nations and national cultures come alive in immediate and tangible ways?” she questions. Caldwell shares her experiences and a historic overview of food culture in Russia, where she has been conducting research since the early 1990s. She also looks at how food and nutrition is promoted in the U.S. through initiatives like the USDA’s Food Pyramid and Michelle Obama’s organic garden at the White House as ways of incorporating food philosophy and civic identity into both the national and physical body. Large budget deficits and high debt levels have troubled many European governments. Michael Hutchison and his co-authors published a paper in the European Journal of Political Economy that shows that European countries that demonstrate financial transparency and a strong institutional commitment to fiscal rules can mitigate this “deficit bias” through explicit, national restrictions on budget deficits in a business cycle. This research suggests that new EU budgetary rules (the “fiscal compact”) are likely to be more effective than previous rules since they are now incorporated into national legislation and supported by institutional reforms. Rosa-Linda Fregoso published a Spanish-language essay in the International Journal on Collective Identity Research about women and cinema in Latin America. Fregoso argues for an intersectional analysis for women-produced films as a way to see a nation in new and nuanced ways. Sikina Jinnah published a chapter on climate change governance in Amitav Acharya’s new book Why Govern? (Cambridge University Press, 2016), a volume that explores the motivation for participation in global governance. She also co-authored with Abby Lindsay (her Ph.D. student at American University) an article in Global Environmental Politics that highlights the ways U.S. preferential trade agreements (PTA) can catalyze significant changes in domestic environmental policy in trading partner nations. With U.S. PTAs under negotiation and a Trans-Pacific Partnership in political stalemate, their analysis is timely. Water Deeply, a website that covers California’s water and drought issues, named Ruth Langridge as an expert to watch on California’s groundwater. They reference her study published earlier this year that revealed court adjudication of California's groundwater basins is focused more on resolving conflicts among water users and less on sustainable groundwater management. In an op-ed in the Washington Post’s Monkey Cage blog on politics, politics professor and award-winning researcher Mark Fathi Massoud analyzes the ongoing political and humanitarian crisis in South Sudan. Massoud, who has studied the region in depth, offers three critical points to help readers understand the problems and possible improvements for the newly independent country. Examining lessons learned from the past several decades for South Sudan’s current predicament, he argues that the country has a long history of migrants fleeing the country due to conflict. Also, religious activism has shown to promote peace in the area. Furthermore, international and local NGOs are helping to improve the country’s democratic health and rule of law. What is the political potential of meditation? Dean Mathiowetz discusses how meditation and mindfulness practices can strengthen citizenship and democracy on KPFA radio, the flagship station of the Pacifica Radio Network. He observes that citizenship is a type of engagement in the world and in the community. Meditation can help strengthen that awareness through what he calls "perspective taking," the ability to be open-minded about viewpoints and understand perspectives other than our own. Michael Urban’s book Russia Gets the Blues: Music, Culture and Community in Unsettled Times (Cornell University Press, 2004) was translated into Russian and appeared as a special edition of the journal Logos. The editors also brought a number of Moscow-based blues musicians into the studio and recorded an anthology of blues songs (mainly originals) for a CD that accompanies that issue of the journal. Barbara Rogoff has a new research video. She was selected to present an “Ed-Talk” for the centennial meeting of the American Educational Research Association. Her presentation highlights the sophisticated collaboration that she and her colleagues have documented among Mexican-heritage and Indigenous children. The video is accompanied by a fact sheet (pdf) that includes more information about the research. The Internet is changing how people learn, remember, and solve problems says UC Santa Cruz psychology professor Benjamin Storm. In a new study published in Memory, Storm says that people who use the Internet to retrieve information are more likely to use the web for future fact-finding missions. Hillary Angelo co-wrote a comment piece in Nature that argues that policy for urban sustainability needs to consider social equity and global impact. For example, as cities become greener, they also become more expensive and desirable. Social displacement can result, Angelo and her co-authors warn. CityLab, The Atlantic’s coverage of pressing issues in the world’s metro areas and neighborhoods featured findings from Lindsey Dillon’s upcoming article that extends the lens of environmental justice to include police brutality. Dillon and her co-author argue that racial disparities in pollution and police violence are socially produced and evident in U.S. cities today. Dillon points to the 2014 death of Eric Garner, who was killed from a chokehold by a police officer. As Dillon argues, Garner’s death can embody a broader political geography of race and racism in the U.S. The San Francisco Examiner also mentioned the study. Jenny Reardon, sociology professor and director of the Science & Justice Research Center was featured in an article in Nature about genetic data and privacy. According to her, “Privacy doesn't get us to what is more fundamental: what as a society should we be doing with this data.” The article also referenced Just Data, a conference she organized on the ethical questions and practical implications in the age of precision medicine. 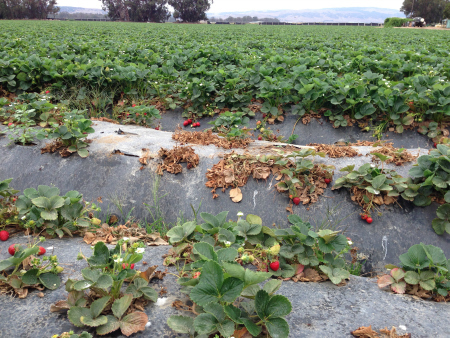 Julie Guthman published three articles about pesticides and California’s strawberry industry. Guthman has spent the past several years immersed—literally and figuratively—in the field to better understand the challenges the strawberry industry faces in a post-methyl bromide world. Her recent findings appeared in Journal of Rural Studies, California Agriculture, and Economic Geography.